Of all the famed authors to have visited Victorian era Indianapolis, who would you most want to see? 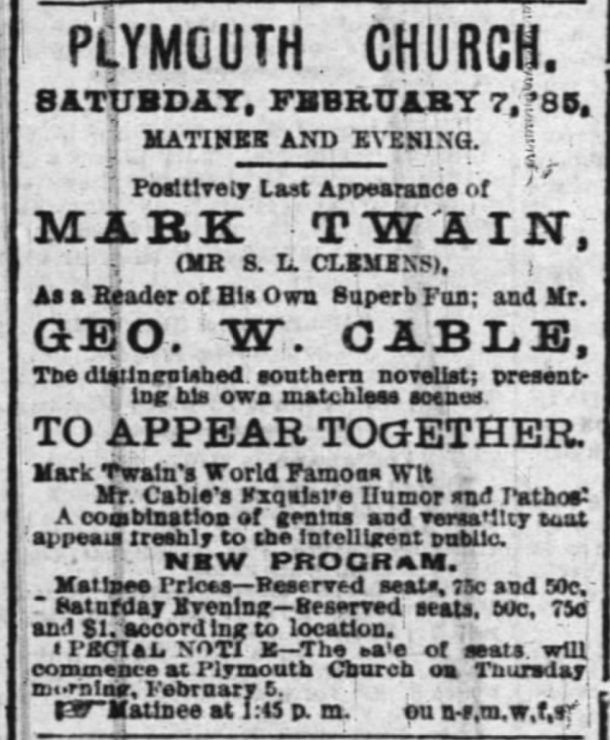 A top contender would have to be Mark Twain, who stopped in Indianapolis in January and February 1885 to delight the locals with oratory of his popular writings. Today, musicians travel the world holding concerts to promote and sell their latest album. In the 1880s, you’d find authors doing the same sort of thing, with a bit less bass. Plymouth church to the right of the English Hotel, prior to their 1884 move to New York and Meridian streets. When Oscar Wilde visited Indianapolis in 1882, he spoke at English’s Theatre on Monument Circle next door to Plymouth Church. 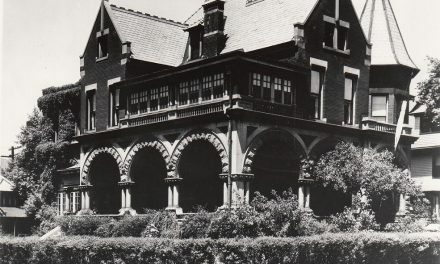 But by the time Mark Twain came to speak to the citizens of Indianapolis, the church had relocated because the English Hotel wished to expand their footprint. 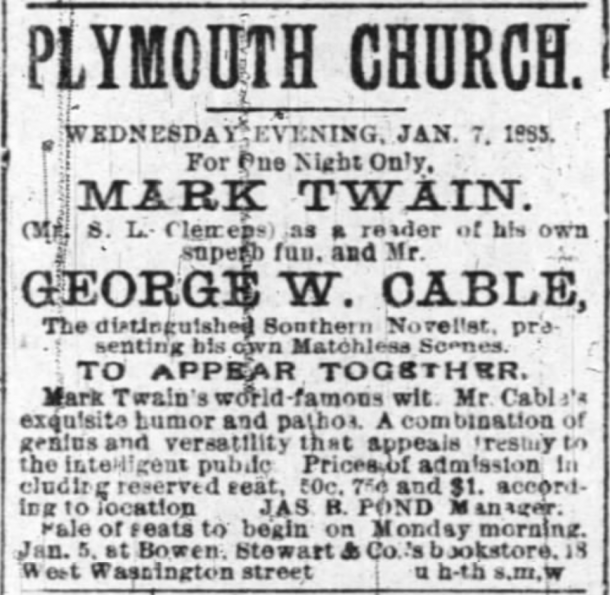 It was at the new Plymouth Church that Twain and his friend and fellow author, George W. Cable regaled locals with their orations. Arguably the most noteworthy visitor in the church’s history came two years after it opened at the corner of New York and Meridian. On January 7, 1885, Mark Twain took turns on stage with his friend, and fellow novelist, George W. Cable, each man reading his writings. “Mr. Cable retires midst great applause and there is much enthusiasm when the awkward and lanky Mark Twain ambles to the front. After gazing at the floor for a few seconds the great humorist begins his selection, ‘Advance Sheets from the Adventures of Huckleberry Finn. '” Each man took turns, like a chest-bumping dance off, sharing a variety of selections from their vast repertoires, alternating accent, tone and voice. After Huck Finn, Cable next read “Kate Riley, Richling and Ristofalo,” then back to Twain with his “Tragic Tale of the Fishwife.” Mr. Cable then sang “several creole sons in a rich voice,” for which he was loudly encored. This went on a few more rounds, ending with Twain’s “The Golden Arm.” The attendees left well-satisfied with the evening’s entertainment. 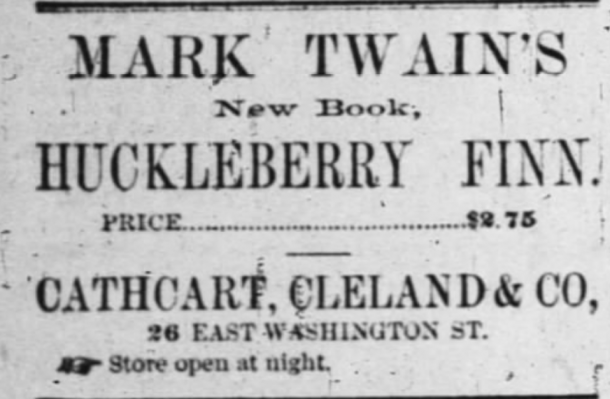 The Adventures of Huckleberry Finn was released stateside in February 1885, just in time to help sell copies subsequent to the Indianapolis visit. The book was released in December 1884 in England; in May 1885 Mark Twain and his friend George Cable headed there to further regale audiences with orations of their writings. Plymouth Church was more than a venue for famous people, but also a hub of social activity outside Sunday services. Their house of worship frequently had events: guest speakers, musical performances, and hosting meetings of numerous local organizations. 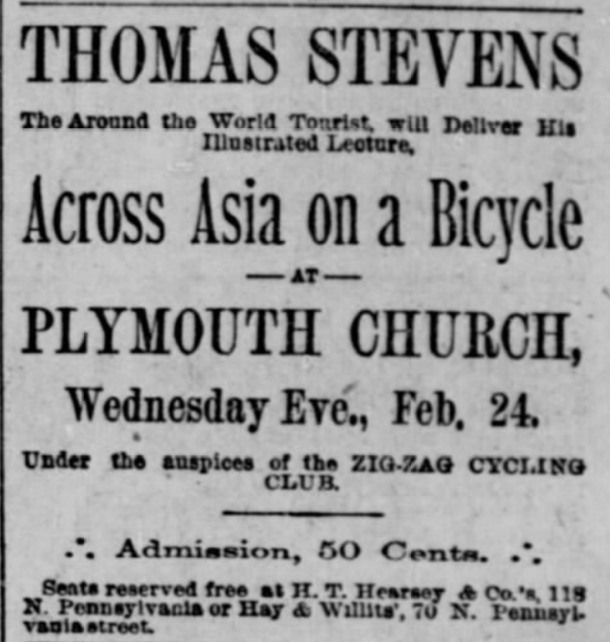 In February 1892, the city’s largest bicycling club, the Zig-Zag Cycling Club, invited a world famous cyclist, Thomas Stevens to present his talk about traveling the world on a bicycle. In two years, he traveled 14,000+ miles starting in Constantinople, and crossed Persia, China and Japan. He recounted his narrow escape from being killed on the trip, many photos and impressions of these far-off lands, so foreign to most Hoosiers of the time. The Plymouth Congregational Church originally organized in August 1857. Their first church on the circle was erected in 1858 and dedicated on September 4, 1859. 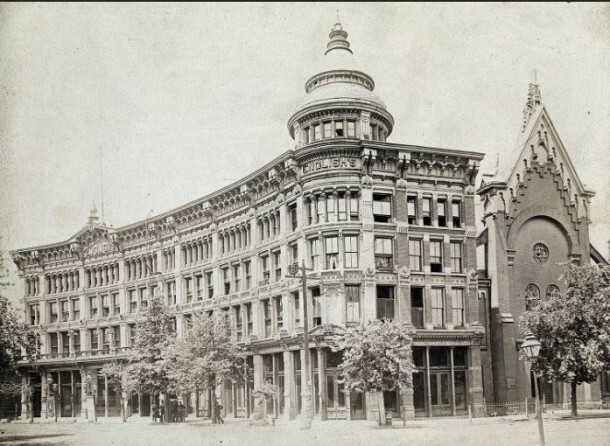 It stood next to the English Hotel, as seen in the image below, until the expansion of the English Hotel in the early 1880s. 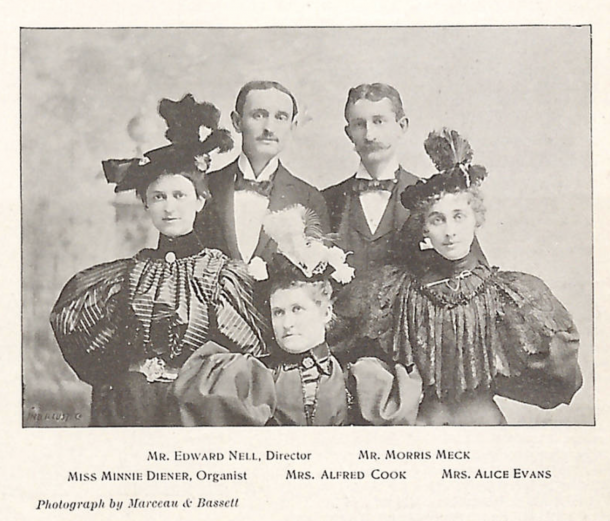 It was February 1883 when the church announced their move to inhabit a new tabernacle at the corner of New York and Meridian streets “next summer.” In April 1883, Messrs. “Yongclaus and Shewmaker” secured the contract to build the New Plymouth church for about $17,000. The design architect was Samuel J. Brown of Boston. 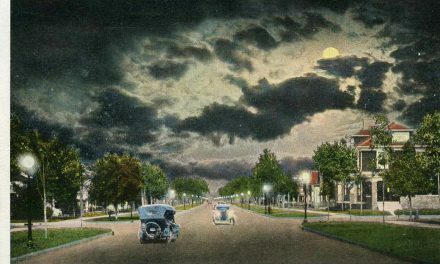 Working drawings were completed locally by E. H. Ketcham and supervised by local architect, Louis H. Gibson. 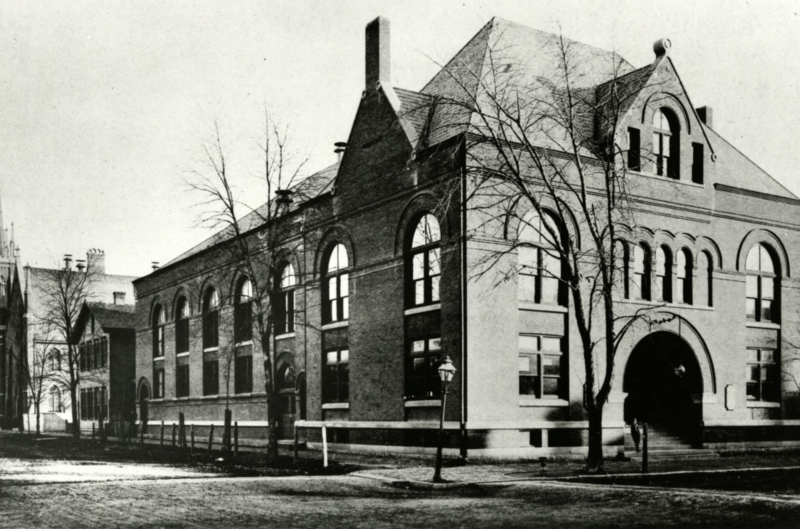 Indianapolis Councilman, George Weaver was subcontracted to do the building’s brick work. In December 1883, the church reported the quick construction would be culminating with a building complete enough to hold services in audience room by the first week of January 1884. 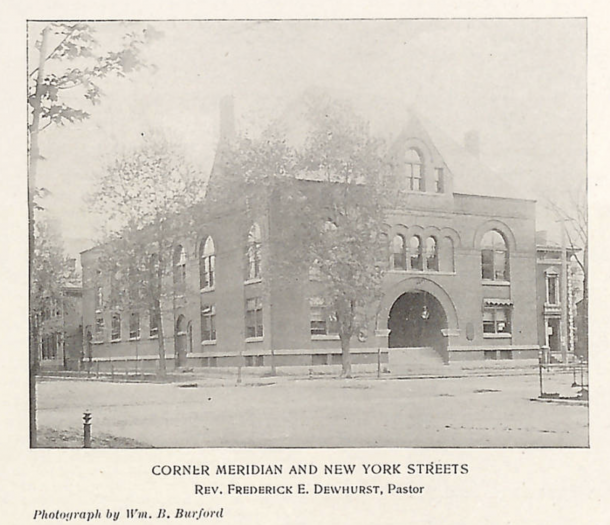 1896 image of Plymouth Church on the southeast corner of Meridian and New York Streets. Their new corner of the world became a busy one, hosting many acclaimed visitors, in addition to regular services. In April 1884, Henry Ward Beecher returned to his former city of residence to speak to the Plymouth Congregation. Formerly the pastor of the Second Presbyterian Church of Indianapolis, Beecher moved to Brooklyn to become pastor of the Plymouth Congregation Church there. All was well at the new location until the government came looking for a large tract of land to build a new federal building at the end of the century. In the end, the U. S. government acquired all the properties on this “square,” acquiring this particular parcel for $48,000. The congregation was allowed to occupy it through September 15, 1901, though their last service in the building was September 1, 1901. The Indianapolis Hebrew Congregation located at 10th and Delaware generously offered to allow the congregation of Plymouth Church to meet in their synagogue while searching for a new permanent home. Thanksgiving 1901, Indianapolis Hebrew congregation and Plymouth Congregational church held a Union Thanksgiving service at the house of worship they were sharing. Plymouth Church’s services continued at the Delaware Street synagogue until the end of 1903, when they moved to the southeast corner of 14th and Central. The Bronx and Brooklyn Apartment buildings now stand on that site. Around 1905, Plymouth Church merged with the Mayflower Church, forming the First Congregational Church, which made their home on the southwest corner of 16th and Delaware streets. That congregation moved northward in the mid-1950s. 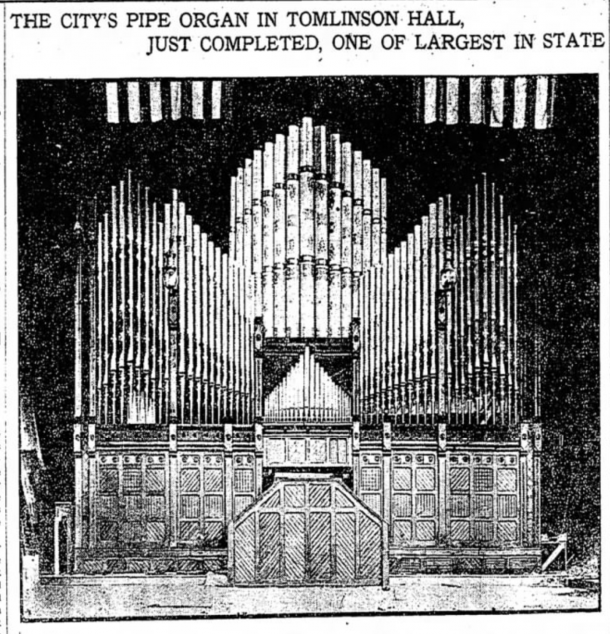 The organ that was once the centerpiece of their musical program, and a huge entertainment draw for the church was relocated to Tomlinson Hall in June 1903 and was still being finessed in August 1903. There were 2831 pipes in the organ and it was changed from choir to chorus class when it was moved to the new location. Interesting that the church still owned the organ, but rented it to the city and others, and in exchange for the hours put in by members of the Board of Public works to install the organ, the city got 1/3 of any monies collected. The change to the look of Tomlinson Hall was described this way: “…its position in Tomlinson Hall adds greatly to the auditorium’s appearance. It extends across the entire width of the stage and reaches nearly to the ceiling.” Presumably, the organ remained at Tomlinson Hall until the building burned in 1958.